The monthly series, held at the Point Richmond Community Center, focuses on documentaries, foreign language films, and independent movies. The documentary California Typewriter, which features Herbert Permillion III of Berkeley’s California Typewriter, will be the next film to screen in the Magick Lantern series. For retired husband-and-wife couple Fred Arm and Kate Spaulding, independent film has been a lifelong love. So, when the Magick Lantern — a short-lived film-screening series in Point Richmond, specializing in foreign and independent films — shut down in 2014, local residents Arm and Spaulding decided to step up and try to revive the screenings. They admit they didn't know how tricky this would prove to be. First, they needed to form a 501(c)3 nonprofit, which they called the Magick Lantern. Then, they needed to find a new space to hold the screenings. They also needed to figure out how to source the foreign language, independent, and documentary films they wanted to show — and they needed to raise money to accomplish all of this. As time went on, supporters who had initially expressed enthusiasm for the project dropped out. "Some people cannot sustain the vision without the reality," said Spaulding. Other supporters of the idea, though, kept contributing money and encouragement. "We felt a deep obligation to people who contributed," she said. "That kept us going and willing to turn over the next stone." Finally, their efforts paid off. When Rochelle Monk became community services director for the city of Richmond, Spaulding said, she helped open the door for them to use the Point Richmond Community Center. Arm and Spaulding rousted up their list of volunteers and brought in their equipment, including a 14-foot screen, for a first film screening on Jan. 12. They showed Stronger, a biographical drama about Boston Marathon bombing survivor Jeff Bauman, played by Jake Gyllenhaal. To their relief, the screening sold out, and they even had to turn people away. They plan to continue to hold screenings once a month, on every second Friday. But challenges to using the community center as a movie theater remain. Arm and Spaulding say they're attempting to find ways to stagger the seating to accommodate more people, possibly up to 75, since the current configuration can only accommodate 35 patrons at a time. While doing this, they need to ensure that sight lines allow the audience to easily read subtitles — an important factor as they plan to show foreign language films. They are also recruiting help in designing a way to screen out ambient light, which will become more of a problem as days grow longer. But the excitement of a first success sustains them. "We hope to catch films right after they've finished their theatrical releases," Spaulding said. She and Arm both love foreign films, pointing to the 1988 classic Cinema Paradiso and the 2014 Argentine black comedy Wild Tales as examples of the quality they hope to book. "We'll look for films that have depth and artistry," said Spaulding. As the series takes root, Spaulding and Arm plan to hold multiple screenings of films to allow more people to attend and to work with the city to request additional time in the center for film festivals and a film club. Arm said one of the best parts of the experience is the connection that happens between people discussing something they all enjoy. He added that at some point, they might even like to secure their own venue. Movie-theater seats have already been donated from a Disney screening room and are now in storage, he said. And Spaulding continues to develop her expanding network of places to obtain the films they want to show. But for now, they are planning one screening at a time. A second film, California Typewriter, will screen Feb. 9. It's described as "a documentary portrait of artists, writers and collectors who remain steadfastly loyal to the typewriter as a tool and muse." 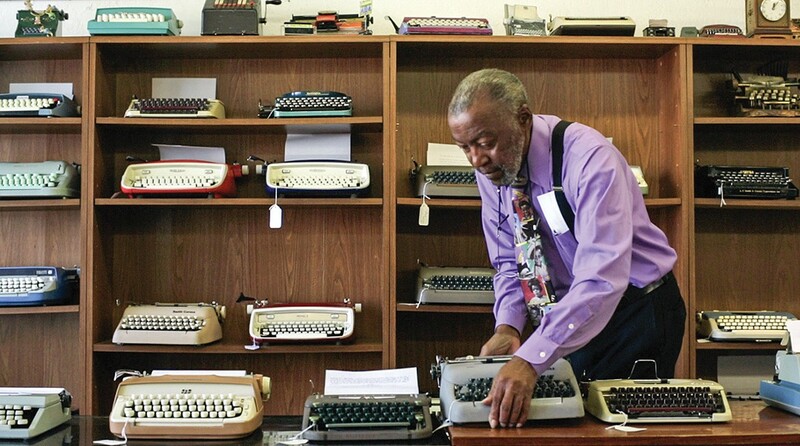 Featuring Tom Hanks, John Mayer, the late Sam Shepard, and others, it also tells the story of Berkeley's California Typewriter, one of the last businesses in the U.S. that repairs aging typewriters. For this event, Oakland artist Jeremy Mayer and repairman Ken Alexander, both of whom appear in the movie, will participate in a question-and-answer session after the showing and then remain for an informal meet-and-greet. As with the initial event, patrons will be able to purchase popcorn, cookies from local bakeries, hot tea, and bottled water. Spaulding and Arm continue to solicit more volunteers to help work the door and staff the concessions area — but, as of now, the future of the Magick Lantern looks bright.